Cheetahs, it seems, just can’t stop shattering everything we believed to be true about them. Scientists have long believed that lions (and hyenas to some extent) threaten cheetah conservation efforts — in large part because they kill so many cheetah cubs. But last year, researchers from South Africa revealed that lions probably don’t kill as many cheetah cubs as folks previously believed. And shortly after that, our research showed that regardless of the amount of lion-inflicted cheetah cub mortality, cheetahs do just fine around large lion populations. Just last month, another story broke that shakes up how we think about cheetahs. It turns out that not only are cheetahs not as vulnerable to killing by lions, but they cheetahs aren’t nearly as vulnerable to non-lethal bullying either. It was thought that because cheetahs couldn’t fight back against lions – or hyenas – they lost a lot of their hard-earned kills to these ruthless scavengers. (Yes, both lions and hyenas do steal food from each other and from cheetahs.) We knew that wild dogs expend so much energy hunting that they can’t afford to lose even moderate levels of food, and assumed that cheetahs were similarly vulnerable. But, as a recent study from Bostwana and South Africa found out, they aren’t. It turns out that despite being super fast, cheetahs don’t expend all that much energy chasing down their prey. Researchers estimate that cheetahs could lose a full 50% of their kills to lions and hyenas, and still get all the calories they need! All in all, it’s beginning to look a lot like the biggest threats to cheetahs aren’t lions and hyenas. 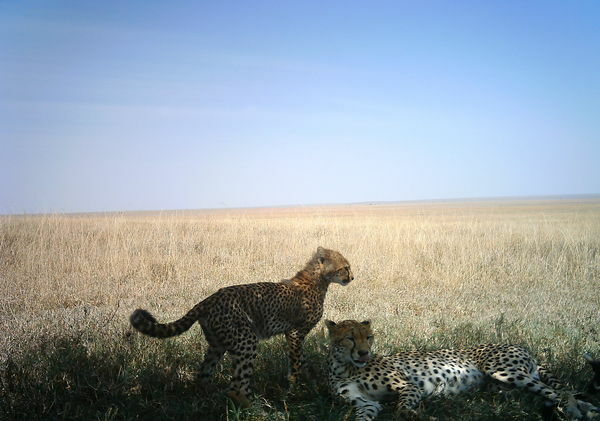 Instead, availability of denning sites (as suggested by our research) and human destruction of habitat that forces cheetahs to travel far and wide in search of prey (suggested by this most recent study) are probably much, much greater threats to their survival. Interesting, Ali. So do you think would it be possible (if difficult) to test whether denning sites really are limiting by building artificial denning sites and seeing if a cheetah population increases? Please start putting the link to the blog updates on Facebook again. I wasn’t checking the blog directly, and only discovered by accident that I had been missing blog updates because I thought they were getting posted onto Facebook. I suppose the upside is that now I have a treasure trove of blog posts to read all in one go!